Is Villanova's comeback the real deal? It’s early, so early – only one month into a college basketball season that’s already seen things go not exactly how we expected. Every coach will remind you how early it is, even Villanova coach Jay Wright, who would have every right to point to his team’s November/December returns and proclaim that, yes, his Wildcats really are the 14th-best team in the country and not just some late-fall fluke. Not that it’s not true. It might be true that Villanova is the 14th-best team in the country. The Wildcats could even be better than that. But this early, there’s no way of knowing whether the most surprising team in the Big East — and perhaps the most surprising team in the country – is for real. Because each college basketball season is played in dog years: The three months from December to March feel more like three years, where teams can go through a roller coaster of ups and downs and where young players can seem to age into veterans and dysfunctional teams can implode. "There’s nothing negative about being ranked 14th, nothing," Wright said when I talked with him last week. "We’ll take it any time. This time of year, wherever you’re ranked, you need to stay focused because you’ve got a long way to go. Going into the season, I thought we’d be a good team. I’ll let everyone else determine whether we’re a special team." What makes a college basketball team special? In my mind, there are two ways to get there. One is the blueblood route: You simply have more talent than everyone else. These days being a blueblood usually means you’re very young. You’re Kentucky with an historically great recruiting class or Kansas with a sky’s-the-ceiling Andrew Wiggins or Duke with a freshman in Jabari Parker who has outperformed everyone else in his recruiting class. The second route is the one Villanova is taking: You’re a deep, balanced team with a mix of underclassmen and upperclassmen and with an experienced, grounded coach who has been able to get his guys to play like a true team even one month in. Back-to-back wins over then-No. 2 Kansas and a ranked Iowa squad have Jay Wright’s Wildcats soaring early. It’s a formula like Villanova’s that teases with what can seem like early-season miracles: an upset of then-second-ranked Kansas over the Thanksgiving holiday, followed the next day by an overtime win against 23rd-ranked Iowa to win the stacked Battle 4 Atlantis tournament. That same formula produced similar results last season, when Wright’s tournament-bound Wildcats beat the fifth- and third-ranked teams in the nation, Louisville and Syracuse, in the same week. Villanova was one of two teams in college hoops to take down two eventual Final Four participants during last year’s regular season. We’re a basket away in the Kansas game and a basket away in the Iowa game from being 6-2, and I do know that. The most interesting thing about the makeup of this team is its lack of height. Only one player in the rotation, 6-foot-11 sophomore Daniel Ochefu, is taller than 6-foot-7. Wright says that’s all part of the plan. "We don’t really look at size in recruiting," he said. "We look at ability, at how big you play not, how tall you stand. "For us and the way we play, that’s an underrated value. We play versatile guys, guys who are basketball players and not necessarily defined by a position." Yet Wright knows how thin the line is – especially in December — between knocking on the door of the top 10 and being nationally ignored. "We’re a basket away in the Kansas game and a basket away in the Iowa game from being 6-2, and I do know that," he said. Ryan Arcidiacono (left) hit the game-winning 3-pointer earlier this season against Kansas. Nationally ignored is more or less what Villanova was going into this season. The Wildcats weren’t even considered a top-three team in the new Big East. Make the NCAA tournament? 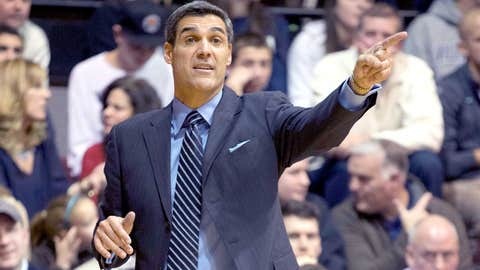 Sure, Jay Wright’s boys usually seem a lock for that. His teams have missed only one NCAA tournament since 2005, the appearances highlighted by that magical 2009 Final Four run. But to be the early-season favorite to win the Big East? And the only team in the league ranked in the top 25? People were talking more about Creighton, or Georgetown, or Marquette, or St. John’s, than they were Villanova. One month in, and people are paying attention. A Dec. 28 game against Syracuse looks to be a holiday matchup between what could be two undefeated top-10 teams. Syracuse will be the heavy favorite, especially since the game will be at the Carrier Dome. But don’t be so confident in writing Villanova off. "These guys definitely enjoy the spotlight, definitely enjoy big games," Wright said. "We’re trying to teach the consistency of bringing that every day, regardless of the opponent, regardless of the hype of the game." Do that and we’ll keep talking about Villanova, not just deep into December but deep into March.